Plated Meals, Food Bars, Global Flavors, and Bite-sized Treats— What’s Taking Center Stage at Corporate Events? Whether the corporate event is a seminar or conference, a company retreat or an appreciation event, a teambuilding experience or a product launch, the food and drink are essential components to its overall success. No matter the event’s purpose or the unique charm of the venue, attendees are guaranteed to judge and remember the food and beverages dished up, whether favorably or adversely. To tap into what’s trending at the table for corporate events in 2017, advice was sought from several in the know. 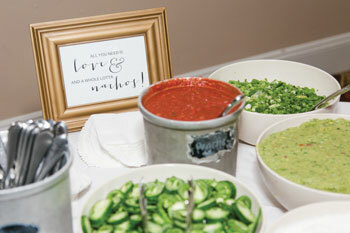 A nacho bar where guests can add the fillings and toppings of their choice. First to share her take on what’s leading the list is wedding industry expert Meghan Ely, owner of OFD Consulting and a member of the National Association for Catering and Events (www.nace.net). For a long time we’ve seen food trucks on the streets serving lunch fare, but now those trucks are appearing at corporate events and even at weddings. “Every year, more event planners are turning to food trucks to satisfy their appetites. Current-day food trucks aren’t what many people are used to seeing in the past. 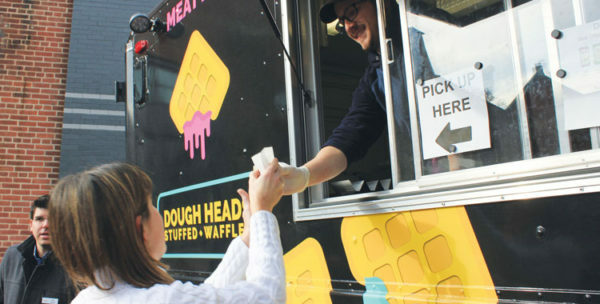 Now they offer a wide variety of foods, including gourmet [items], local ingredients, and restaurant-quality meals,” says Drew Cordell, owner of Dough Heads Stuffed Waffles in Lancaster, which serves stuffed, yeast-risen waffle pockets. “Instead of making a mess at your event, we bring a commercial kitchen on wheels to you. Nahid Farhoud of Nahid’s Global Events, which specializes in multicultural events, also speaks to this trend. 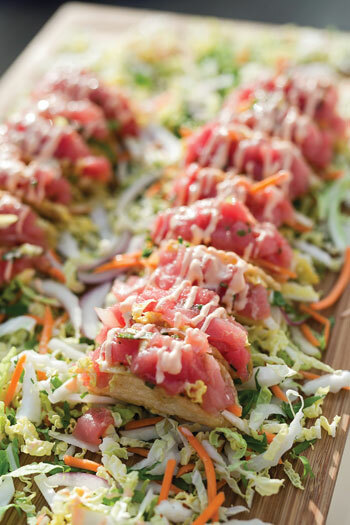 Mini tacos, which can be filled with veggies, ahi tuna, or sushi, or even sweet desserts. 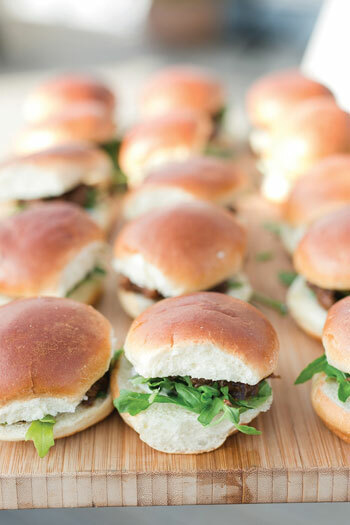 Sliders—and who doesn’t love a bite size hamburger or two? “Live-action food stations are very popular right now, with international cuisine highlighting different parts of the world taking center stage,” Farhoud says. 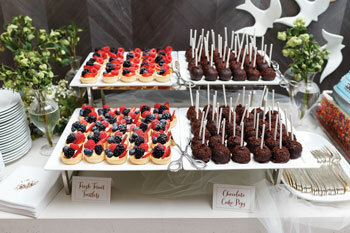 The manner in which food is served is also a consideration for any corporate event. Engaging and interactive elements are part of the growing movement referred to as “experiential catering,” Ely says. Jones points out that the goal of the function and who will be attending help determine the style of both the food and service. And what about the meal that starts off the day—the all-important breakfast that fuels the guests for the morning’s activities and programs? “Expect to see yogurt parfaits with flaxseed granola and agave nectar, house buttermilk biscuit sandwiches, and house-cured salmon displays in this year’s breakfast breaks,” Jones says. “Bite-sized sweets are taking the industry by storm,” Ely says. Rather than traditional slices of cake, look for small pastries, pies, and other desserts. 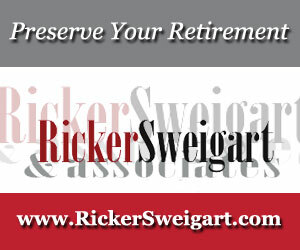 But do take heart—with smaller offerings, you can treat yourself to several different samples without overindulging. And again, Ely says the experiential-style catering trend makes room for dessert bars, including “gelato bars, s’mores stations, and pie tables,” allowing guests to pick and choose as they please. All this talk of trending food makes one curious about the beverages being offered—are the customary drink selections being swapped out? She says this trend presents a local flavor to the event and provides guests the opportunity to explore new drinks they would not ordinarily be able to order.